What is Search Engine Experience? With the new Google changes in their search results we should re-look our own strategies, and how we group our teams/agencies to achieve the best Experience on Search Results. 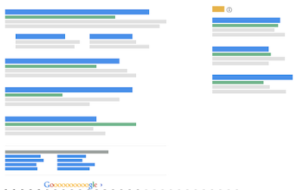 The term Search Experience Optimization is not something new, Google uses the term, and in these articles from Search Engine Land and Search Engine Watch. 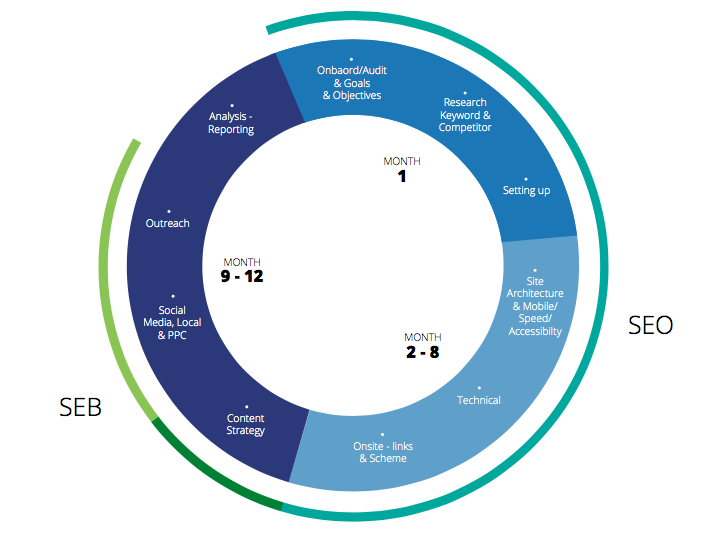 So what makes Search Engine Experience methodology different? Search Engine Experience is using SEO and Search Engine Branding to optimize or to brand all the possible areas so your brand can be seen online by searchers. Use Search Engine Branding to increase visibility of your brand & create the best experience on Search Result pages. The majority of online activities starts on search engines. Search Engine Result pages are a canvas for your brand. In a nutshell, the purpose of SEO is to rank your website through Technical & Onsite SEO, while Search Engine Branding is becoming your Offsite SEO, optimizing every other platform and way possible to be visible on Search Results, and increasing the Search Engine Result Experience. 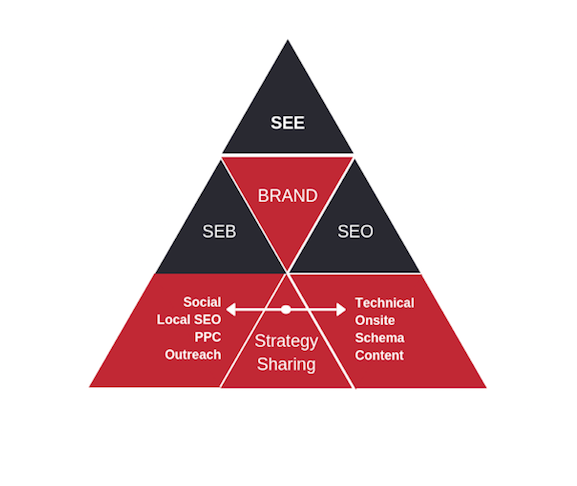 SEO will be the research, technical and onsite side of your SEE structure. Your Outreach/Offsite of traditional SEO will now be in Search Engine Branding along with PPC, Social, Email, Local SEO etc. Before you start your SEO campaign, you have to do a full SEO Audit, Keyword Research, and Competitor Research/Analysis. Set your benchmark, goals & KPI’s and control docs. My Google Sheet that I work from and Copywriter (after getting website data using Screaming Frog). See Outreach below under Search Engine Branding. “In SEO campaigns, the primary goal of outreach is to create valuable backlinks from off-site websites to the client website. These links improve organic rankings and expose the company to new audiences, driving highly qualified organic and referral traffic to the client.” – www.straightnorth.com, OUTREACH FOR SEO. Get backlinks to rank higher, up your domain authority and get potential prospects & leads. Social Media is a powerful channel to reach prospects & potential leads. Reaching out to your social group you can up your Brand Awareness, and get leads to your Website, by using effective CTA’s. Social Media photos are also showing up on Google’s SERP. PPC is not organic ranking, however, it can be used to buy your way to the top to show on the Results page. Google Search can enable a rich set of features for your page in search results. The problem? Google first has to understand your content. Using Structured Data (Schema) will allow you to serve your content to Google and appear in Rich Features. 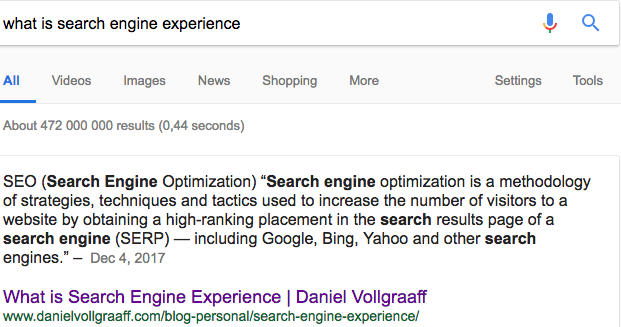 Rich Snippet for “What is Search Engine Experience” however Google took the wrong information of my page. Trying to get Google to take the correct information. Using Pinterest can improve your chances to get your images displayed. Remember to use your keywords and add the relevant information to your image on Pinterest. For agency. Inhouse timeline might look different. The original SEO methodology can be used to achieve all of the above-mentioned -results, but for our agency we have adopted the SEE (Search Engine Experience) methodology to align our different departments to focus on the same goal, making them work together, instead of competing. This increase the chances of our brands to become more visible on Search Results pages, and it also provides one goal to works towards for all SEM teams. Take advantage of the GIF option in Google Images. So many ways to brand your results or up the Search Engine experience. Stay up the great work! You realize, lots of people are looking round for this information, you can help them greatly. Excellent post. Very helpful information.